on November 14, 2014 9:42 a.m.
STRONGSVILLE, Ohio — If you want to find the top talent in Northeast Ohio basketball, the first place you should check is the basement of a mansion in Strongsville. During the basketball offseason, it’s not out of the ordinary to find players like Villa Angela-St. Joseph senior Carlton Bragg, St. Edward senior Kipper Nichols and junior Derek Funderburk and East Tech sophomore Markell Johnson in the bottom floor of this house. 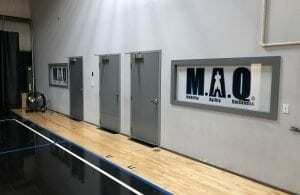 They are there because it’s the main basketball facility for MAQ Training (Mobility, Agility, Quickness). Inside this basement is a basketball court, workout area with top of the line equipment and a locker room. Running the show is Dave Schierbaum, the founder of MAQ. He believes that everything you can get from a shooting, strength and vertical coach, you can get from him. “You can get all of that stuff done with one person, if you have someone who is knowledgeable on the basketball side and you have somebody who can develop the explosion, vertical and strength portion,” Schierbaum said. A Valley Forge graduate, Schierbaum played football at Baldwin-Wallace until he graduated in 2002. He played some arena and semi-pro football and trained players at the Omni Fitness Club in his spare time. That training became a career. While at Padua as an assistant volleyball coach, Schierbaum began training high school basketball player Tyler Ptacek. The Ptacek family tried 10 different trainers before finally setting on Schierbaum. The Ptacek connection began the high school basketball connection for Schierbaum. Ptacek played for Ohio Basketball Club, an AAU team. Schierbaum began training many of the team’s players in Ptacek’s house — which is the mansion in Strongsville. Soon word of mouth began to spread about what Schierbaum and MAQ was doing for high school basketball talent. When a basketball player first comes to MAQ, he’ll work Schierbaum and his assistants Tejay Anderson and Brittany Stegmaier. They will take the player through 14 different exercises to get a baseline of things like hand-eye coordination, level of fundamentals within sport and their strength and agility. Every session after that will be based on increasing the performance from the baseline. “It gives us an idea of what their weaknesses are so we can get them up to their strengths,” Schierbaum said. The players are then taken through rigorous workouts with the latest techniques. Players will wear resistance bands or weighted vests while doing their skill work. In the workout facility, overspeed treadmills and a Vertimax are part of the repertoire. 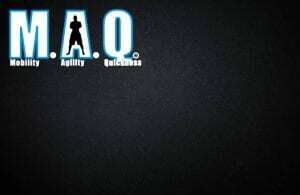 During these workouts, MAQ prefers smaller numbers to increase individual work and also cause competition. When the workouts are over, the staff will supply the athletes with at-home training that requires just body weight to perform. The results are clear. MAQ has had more than 100 scholarship athletes in Division I for football, basketball and volleyball, and 72 percent of its senior athletes that were intending to play college athletics receiver at least a partial scholarship. When it comes right down to it, it’s all in the name for MAQ. Players are leaving with increased mobility, agility and quickness, and that’s what college basketball teams are looking for. How can I sign up for basketball training?